Dr. Abdul Waheed Khan, an internationally recognized leader in the application of information and communications technology for education and development, has joined the Crowdmark Board of Advisors. Dr. Khan will advise Crowdmark on strategy and on opportunity creation for students, instructors and institutions. With his vast experience leading technology-driven change in the global education system, Crowdmark welcomes Dr. Abdul Waheed Khan to our leadership team. Dr. Khan was Founder, President, and CEO of the Indira Ghandi National Open University (IGNOU), an institution with a current enrollment of 4.2 million students. He was Founder President of Talal Abu-Ghazaleh University of Business (TAGUB) in Bahrain. For nearly a decade, Dr. Khan served as Assistant Director General for Communication and Information at UNESCO, where he was responsible for UNESCO’s global programs in communication and information. 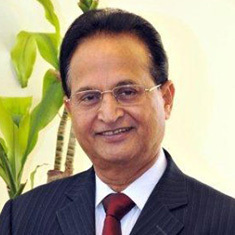 Dr. Khan is the recipient of numerous awards and distinctions including honorary doctorates from The U.K. Open University, Wawasan Open University, Malaysia and Jamia Hamdard University, India. Dr. Khan earned his doctorate and master degrees from the University of Wisconsin, Madison, USA.